I applied to a cotton pad and wiped over my eyes. This completely removed all trace of make up on not only my eyes, but my face. I was actually pretty impressed. I have very high standards when it comes to make up remover and this exceeded my expectations. Not only did it completely remove all my makeup, it made my skin feel so silky soft afterwards. Our revolutionary fine MAKE-UP REMOVER MILK is a 2-in-1 make-up remover/moisturizer that can remove all makeup, even stubborn eye makeup. So not only does it remove all that makeup that clogs pores and prematurely ages the skin, it leaves your face feeling fresh and moisturized. This convenient ability makes it perfectly suited for make-up artists working out in the field, and other busy professionals. So if you're on the go, just wipe off that make-up and get on with your day! Our ingredients are sourced from nature according to the strictest standards, so you can be guaranteed that they are free of sulfates, parabens, GMOs and other nasties. These ingredients include Avocado Oil, Aloe Vera, and Castor Oil. Each one provides a different benefit to your skin. fine is tested by dermatologist and found to be non-irritating. fine is nominated as the best product of year 2013. 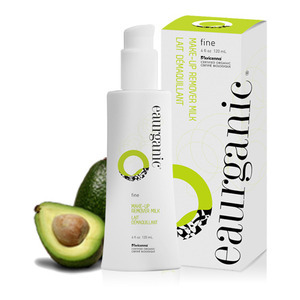 Organic Avocado Oil is an excellent moisturizer that penetrates deep into the skin. It's packed full of Vitamins A, D and E, as well as lecithin and potassium. It also reduces age spots, and heals sun damage and scars. Organic Aloe Vera is another excellent moisturizer that also has anti-inflammatory properties. It's also packed with Vitamin B Complex, Vitamin C, folic acid and carotene. Soy Lecithin, an excellent source of choline. Choline is one of the main components of cell membranes, making it essential to every living cell in the body. Choline keeps cell membranes healthy, allowing important nutrients to enter the cell. Soy lecithin also helps generate adequate amounts of Vitamins A, D, and E.
WATER/AQUA/EAU, RICINUS COMMUNIS (CASTOR) SEED OIL*, LECITHIN*, GLYCERIN, THEOBROMA CACAO (COCOA) SEED BUTTER*, CETEARYL GLUCOSIDE, CETEARYL ALCOHOL, BENZYL ALCOHOL, SALICYLIC ACID, SORBIC ACID, PERSEA GRATISSIMA (AVOCADO) OIL*, SODIUM STEAROYL GLUTAMATE, TOCOPHEROL, POTASSIUM SORBATE, FRAGRANCE/PARFUM°, SODIUM PHYTATE, CITRIC ACID. Step 1 – Take 3 or 4 pumps of the milk and apply it to your face. Step 2 – Massage it into your skin to lift all foundation, tanner, bronzers, etc. Step 3 – Wipe away the make-up with a dry cotton pad. That's it, you're done! Unlike other make-up removers that contain harsh chemicals you need to rinse off, fine has plenty of organic emollients that return moisture to your skin. You could just leave it on and go about your day. But if you really want that tingly feeling of freshly cleaned skin kissed with a light citrus scent, splash your face with our splashULTRA MILD FACIAL CLEANSER.Your skin will thank you! 2-in-1 Moisturizer and Make-up Remover? Is that possible? In fact, fine is so rich and nourishing that once you're done using it, you don't even need to rinse it off – you can just leave it on. It doesn't have any of that gunk that you might find in other drugstore make-up removers. This unique ability is one of the many reasons that Fine was selected as a 2013 Product of the Year finalist in its category! 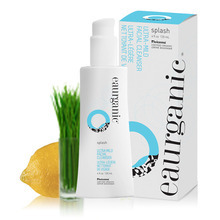 Our fine MAKE-UP REMOVER MILK uses Certified Organic ingredients to remove all make-up from your face. 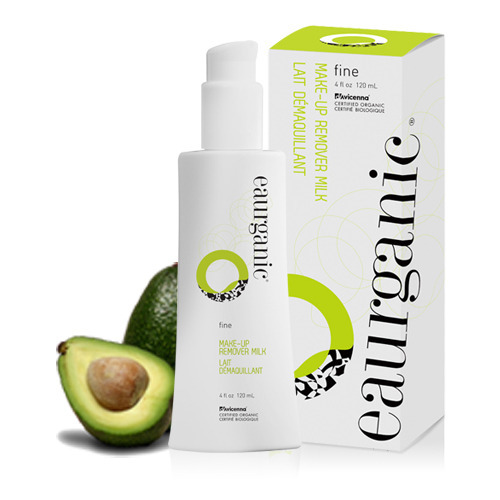 In spite of its strength, fine contains no harsh chemicals and is gentle enough to use on even the most sensitive skin.